﻿ MEININGER Hotel Frankfurt/Main Messe Frankfurt am Main. JIMAT di Agoda.com! Ada soalan mengenai MEININGER Hotel Frankfurt/Main Messe? Sama ada anda melancong atau ke luar kawasan kerana kerja, MEININGER Hotel Frankfurt/Main Messe merupakan pilihan penginapan hebat ketika melawat Frankfurt am Main. Hotel ini tidak terlalu jauh dari pusat bandar: hanya sejauh 6 km, dan kebiasaanya mengambil masa kira-kira 10 minit untuk sampai di lapangan terbang. Tidak kurang hebat adalah akses mudah hotel untuk ke pelbagai daya tarikan dan mercu tanda bandar, seperti Pameran Frankfurt, Muzium Alam Senckenberg, Leipziger/Pusat Beli-belah Schweizer Strasse. Perkhidmatan hotel kelas pertama dan kemudahan yang menentukan pengalaman Meininger Hotels menanti anda di MEININGER Hotel Frankfurt/Main Messe. 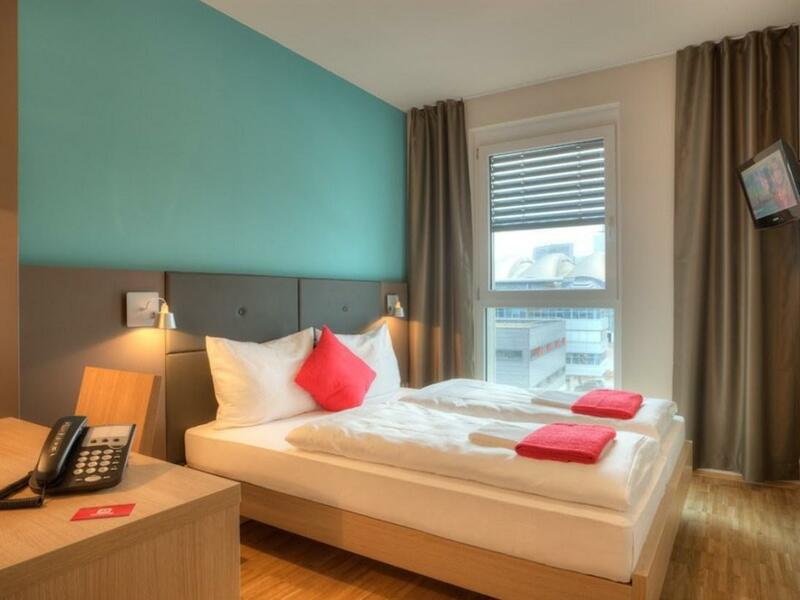 Khidmat bilik 24 jam, Wi-Fi percuma semua bilik, meja depan 24 jam, simpanan bagasi, Wi-Fi di tempat awam merupakan beberapa kemudahan yang membezakan MEININGER Hotel Frankfurt/Main Messe daripada hotel-hotel lain di bandar. Hotel-hotel telah direka demi keselesaan dan memudahkan tetamu. Sebahagian bilik menyediakan televisyen skrin rata, produk pembersih, linen, tuala, almari. Hotel ini menyediakan kemudahan rekreasi yang baik seperti meja biliard untuk membuat penginapan anda benar-benar tidak dapat dilupakan. Apa juga tujuan lawatan, MEININGER Hotel Frankfurt/Main Messe merupakan pilihan yang terbaik bagi penginapan anda di Frankfurt am Main. overall stay was good. arrived early at the hotel and the staff allowed me to checked in earlier. that leave me more time for the day! checked in without any problem and it was quick. nice clean room with clean toilet. only dislike the bed. they should upgrade their bed to a hotel grade bed.otherwise it would be a great stay. Dear guest, thank you for your positive feedback. We are looking forward to your next stay in our hotel. Your Meininger Hotel Frankfurt Convention Center. We were only in Frankfurt for one night but it was exactly what we needed. The room is a little "tight" but it wasn't bothersome. It was extremely well kept and clean. The hotel offered breakfast and offers snacks/beers at the reception. There's also free wi-fi throughout the hotel and a small mall less than a kilometer away. Frankfurt's main train station was about 2k away but an easy 15-20 minute walk. The staff was friendly and helpful. 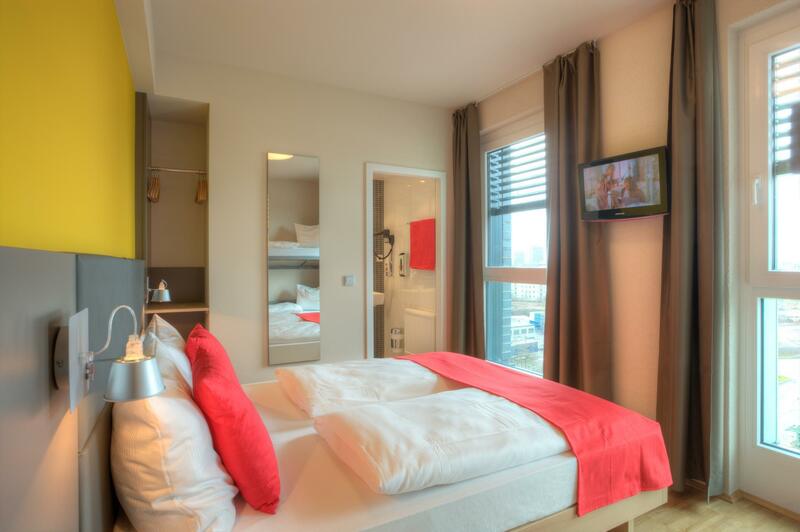 If in Frankfurt, we would stay here again! ForMEININGER Hotel Frankfurt/Main Mess, it only 5 mins walk to the Frankfurt Messe station, and for two station you can go to the Frankfurt HBF, the city centre which is super convenience. For less than 10 mins walk there is a big shopping mall Skyline Plaza Frankfurt that you can buy everything there. In the shopping mall, there also a supermarket for daily uses. One things need to remind is there is no teeth brush provided, so you need to bring your own. But in general, for this price range, this is a very good hotel. I had a nice time in this hotel during my stay; I even rented a bike to get around the city. The only problem I had was with the staff. They respond badly to any specific wishes you ask from them. I wanted to put my drinks on my hotel room, and they made me feel that I was causing hassle to them, which is ridiculous for a 200 euro per night hotel. Provided option of a family room which was very useful (oldest child now 19 so many hotels required us to book 2 rooms - 2 adults + 2 children). Although room was small it was very good value for what we paid and an adequate base. Had a very pleasant experience here. We came as a large group of about 14 people. Having multilingual staff was helpful. Reception was nice. We spent several evenings socialising. The location was next to our venue and half the price of everywhere else nearby. The beds were a bit too soft and being next to a railway meant the soundproofing could have been improved a bit more. Rooms were small, but we typically only used them for sleeping. I'd likely use them again, and would recommend it to anyone who doesn't want to spend a lot of money on a hotel. This was a great experience; the staff was very friendly and helpful, and the rooms are well kept and extremely modern. Nothing fancy about this hotel, but it's the comfort level that sets it apart. The location was also great- right by the Skyline Plaza. Very close to a subway station as well. I came 4hrs before scheduled check-in, but my room was already ready and they let me go in. I paid €140 for two nights, which was a great deal for the quality. Only drawback is that breakfast isn't included. The room is very compact but clean. Nearby to train station but you may feel a bit far to walk. There is a shopping center that you can visit and have your lunch or dinner there. 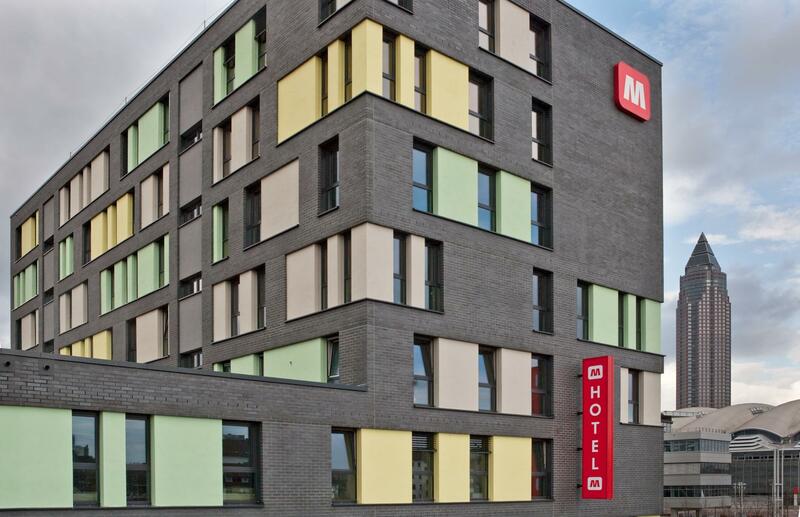 Satisfied with the overall stay at Meininger Hotel Frankfurt. Close to train station and Frankfurt Main. Good shopping centre near by. Quiet district. I was very impressed with the room. I had a private double with my own shower and it was very clean and tidy. The bed was really comfortable and I had just arrived from Australia so I need to have a good sleep. The staff were very nice and helpful. The station is also very close and I would definitely stay here again! Sehr geehrter Gast vielen Dank für ihre positive Rückmeldung. Wir hoffen sie bald wieder bei uns begrüßen zu dürfen. Ihr Meininger Hotel Frankfurt Messe. We had a very pleasant stay. Messe is the nearest S Bahn station. 10 minutes walk to restaurants and Skyline mall. Rooms a bit small but clean bathroom and comfortable beds. They also have a guest kitchenette so you can cook your own meals (pots, cutlery, dishes provided) and even do laundry. 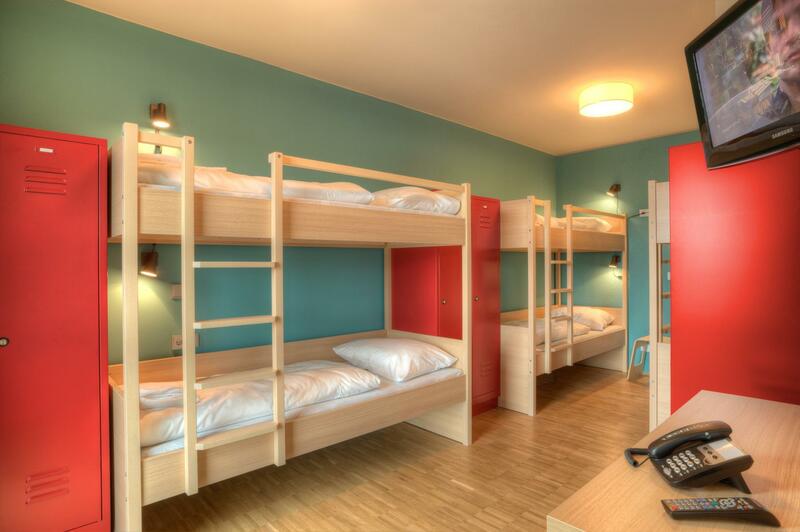 Great concept for a budget hotel. Highly recommended. Me and my parents stayed there for two days. The location is excellent, just 5 mins walk from the subway station. The staff are friendly, the hotel has a good ambiance. The rooms are clean, however they are too small. We had a double room with an extra bed, and we barely had space to walk. The breakfast was decent, but has very limited options for vegetarian people. Value of money; simple and clean. Room and bathroom were both simple but well-designed and very clean. Quieter than I was expecting, despite being close to road and railtrack. Staff were efficient, check-out and breakfast options were good. Not far to walk to the station, to a few nearby restaurants, and supermarket in the Skyline shopping centre. The area around the hotel and Skyline Plaza is a big building site (March 2015) but likely to be improved soon. My first stay at a Meininger Hotel and I'd use them again. Fine! We were treated well when we arrived early- the Staff did everything to get us into our rooms EARLY- This was truly appreciated! Breakfast was extremely reasonable and the rooms quite comfortable. We were pleased with our visit. I always enjoy staying at Meininger. Stayed in the some of the ones in other cities before, so I knew what to expect. The hotel was clean with modern facilities. Felt very comfortable to stay in. Was only there for three nights, and whilst the hotel location is a bit of a walk from nearby Messe station, it is very suitable for solo or light travellers. 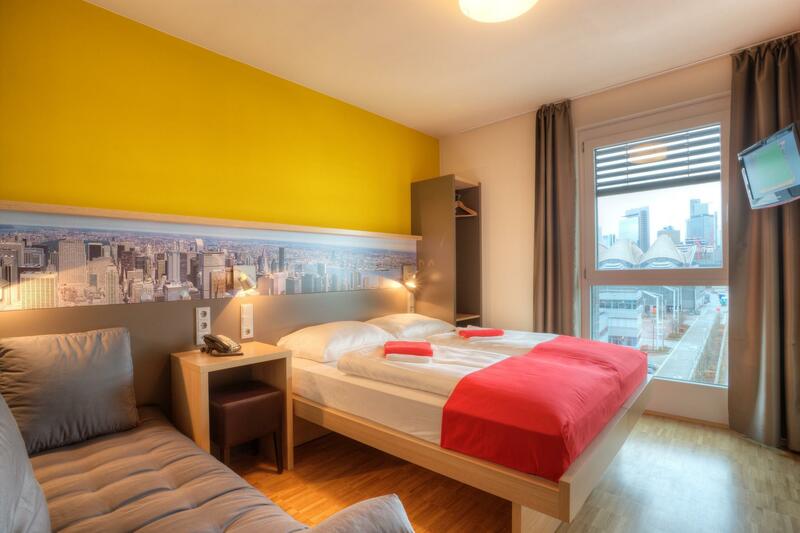 About 10-15 walk to nearby Skyline shopping centre and half an hour walk to the Frankfurt financial center. Enjoyed my stay very much. Thank you! Great stay during Frankfurt's Automechanika. Hotel was located just behind Exhibition Hall 4 and was just 5 minutes walk away. The breakfast was good and staff were helpful and friendly. The rooms had all the basic necessities, although a tad small, was more than sufficient for business stay.